A high-pass and low-pass filter with 6dB or 12dB/octave. Each section has a x10 switch for a broad range. TK Audio’s mission is to make creative audio solutions. Quality products that helps you create the best sounding music whether it´s in the studio, behind the mixing console or at a live venue. Our products are exclusively made in Sweden. At our workshop we do everything from designing the circuit boards, assembling and soldering as well as the final production tests. We believe in the quality of knowledge, handcrafting and keeping the production environmental friendly. Thomas “TK” Kristiansson started TK Audio in 2008 as an additional brand to Vintagedesign (as Thomas been running since 2001). The company is located in Halmstad, a small town on the southwestern coast of Sweden, known for its beaches, golf courses and the pop group Roxette. 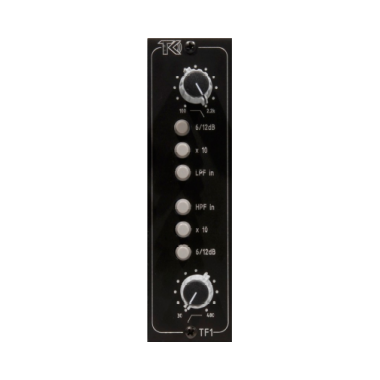 TK Audio has a wide range of products both in the 19” format and 500-modules. This gives you possibility to choose TK Audio for many of the different stages of your music production.